The largest global sports media property in Asian history, ONE Championship, recently held the official ONE: Conquest of Champions Face-off and Open Workout at the Victoria Sports Tower in Manila. ONE Heavyweight World Champion Brandon “The Truth” Vera (left) of the Philippines and his opponent Mauro “The Hammer” Cerilli of Italy face the media. In attendance was reigning ONE Heavyweight World Champion Brandon “The Truth” Vera of the Philippines, as well as his opponent Mauro “The Hammer” Cerilli of Italy. “Thank you everyone for coming out here, it is an honor to be your champion, Philippines. I’ve been away for a while, almost two years, but don’t think for a second that I haven’t been training and keeping sharp. I’m stronger, faster, smarter, and better now than ever before. My team has made sure that I will be at my best by the time I step back into the ONE Cage. This is home for me. I really missed this and I am excited to perform in front of you all next Friday night. 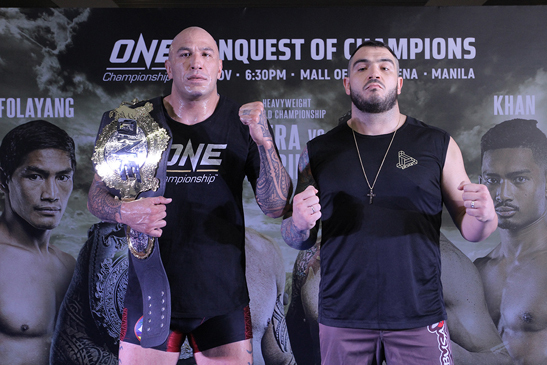 The belt is going to stay in the Philippines,” said Brandon Vera, ONE Heavyweight World Champion. Co-main event participants Eduard “Landslide” Folayang of the Philippines and Amir Khan of Singapore also faced off. “I am so happy for the opportunity to once again be fighting for the world title. As always, I feel motivated and encouraged to do my best. I want to prove to the world that I am not done yet in this sport, and that I can still be world champion. Losing the title for the first time, it was a very painful feeling. But in defeat, I have discovered my weaknesses and made efforts to improve certain parts of my game. Now I am ready to showcase my championship form once again. Amir [Khan] is a great young martial artist. He has shown tremendous growth since his very first ONE Championship bout. I cannot underestimate him because he is younger than I am. This bout is special because it’s taking place in front of my hometown crowd in Manila. It also represents a chance for me to redeem myself, because this is the same place I lost the title one year ago. I have worked very hard since then and now the opportunity was once again given to me,” said Folayang. Ticket information is available at www.onefc.com.